Are you the impatient type? Well, have I’ve got news for you. 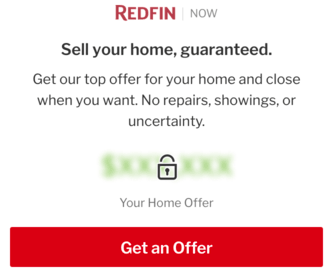 A new service dubbed “Redfin Now” will get you a “top offer” for your property within 24 hours of it being viewed. That’s pretty fast. 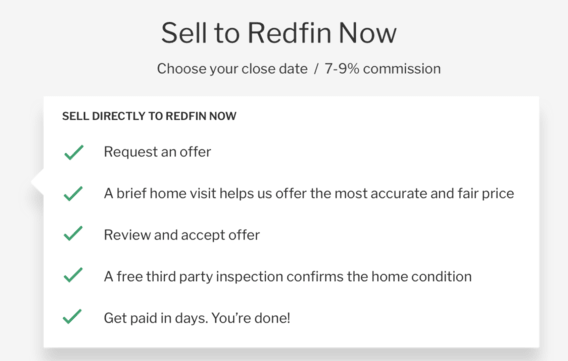 Instead of dealing with the hassle of finding an agent, listing the property, getting a buyer to bite, then waiting weeks for it to sell, you can just turn it over to Redfin Now instead. “offer a complete solution.” That is, everything you need to buy and sell a home, including a mortgage and title and escrow services. Yep, in 2016 they launched their title and settlement business “Title Forward” in eight states, and about half of their customers used the company. And in early 2017, they began originating and underwriting mortgages for their customers via Redfin Mortgage in the state of Texas. The new service from Redfin bills itself as a hassle-free way to sell a home quickly, while eliminating the stress and uncertainty. Redfin Now is a “cash buyer,” so you don’t have to worry about them getting their financing in order. You’ll just receive a check once the process is complete. First, you request an offer online. Right off the bat you’ll see an “initial offer range,” which is basically the high and the low of what they think your property is worth. It’s based on thousands of data points from Redfin’s database, factoring in things like the year built, square footage, comparable sales, local demand, and so on. It might be loosely based on the Redfin Estimate for the property. The company does point out that you might be able to sell your home for more than the Redfin Now offer on the open market. But if you’re cool with that range, you can have a Redfin Now representative visit your property to assess the condition and do whatever they need to do to ensure they’re making a precise offer. It takes about 30 minutes, they say. Within 24 hours of seeing your home, you’ll get a specific “top, no-obligation offer for your home” that is good for seven days so you have time to think it over. 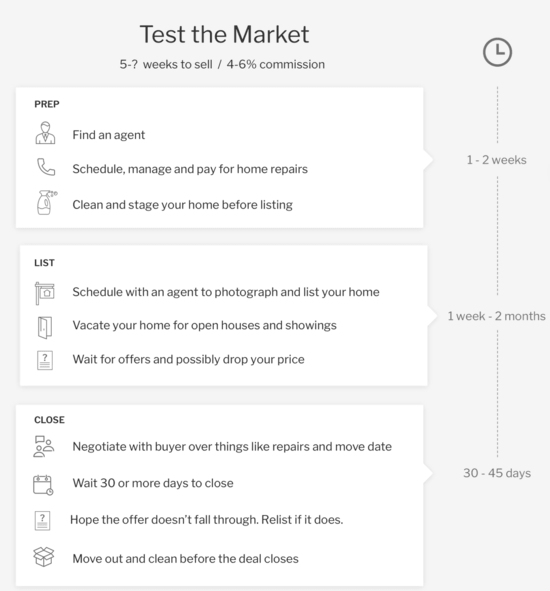 Assuming the price works for you, you’re free to pick a closing date and move date. You can choose a date anywhere between seven and 60 days from the date you sign the offer with Redfin Now. Yes, you can move out of your home in a week, apparently. Redfin says this flexibility could help a homeowner avoid paying two mortgages, or avoid moving twice. That’s always nice. You also don’t have to concern yourself with cleaning the place (or making the bed), or doing repairs. That’s all part of the deal with Redfin Now. However, once an offer is drawn up and accepted, Redfin Now will send out a third-party inspector to assess the condition of the home. That could further reduce the sales proceeds. Like a typical sale, you’ll be able to make the requested repairs yourself or have them deducted from the sales price. It’s unclear if you can “negotiate” these costs. Redfin says they’re typically between 0-2% of the sales price. It should be noted that not all homes are eligible to be purchased by Redfin Now, and they’re only purchasing homes in select markets at the moment during what is assumed to be a test run. Those markets include the Inland Empire (think Riverside County) and San Diego. And now Dallas, Los Angeles, and Orange County too. First off, it must be either a single-family home or a townhouse/condo, the latter of which requires HOA review. Secondly, it must have been built after 1960, and the total lot size must be under half an acre. Additionally, it must be owner-occupied or vacant, in good condition, and with clear title. Lastly, the Redfin Now estimated value must fall between $150,000 and $550,000. Homes that probably won’t qualify include those in age-restricted communities, those occupied by renters, those with unpermitted additions, and properties with major foundation issues. They also don’t seem to be interested in homes with solar leases, bank-owned homes, and homes with underwater mortgages. Go figure. What Does Redfin Now Do with Your Home? So you might be wondering what Redfin Now does once you agree to sell them your home. Clearly they aren’t keeping it for themselves. And because time is of the essence, especially whilst holding onto expensive real estate, they’ll want to reload it as quickly as they acquire it. That means they need to act fast on both ends to ensure things move along smoothly. Well, because they are (or want to be) the end-to-end real estate solution, they’ll hit the ground running once you move out. In no time at all, they’ll make the necessary repairs and prep the home to list it on, you guessed it, Redfin. As for who will be the agent, that’s unclear, but likely a local Redfin agent. And perhaps the buyer will get a mortgage from Redfin Mortgage and use their title company too. What’s interesting is that even if they don’t sell it for much more than they bought it, they can still make a pretty penny on the churn. I never mentioned Redfin Now pricing, which is anywhere from 7-9% commission, plus any necessary repairs, closing costs, and so forth. That means Redfin Now might be able to pocket some 10% of the home’s sale price and then make even more when they turn around and sell it. So even if the next buyer doesn’t offer much more, it could very well be quite profitable. In summary, it looks like Redfin is trying to go head-to-head with the likes of Zillow Instant Offers and Opendoor, another company that buys and sells home in what might eventually be a matter of days. Oh, and by the way, Redfin is going public. The whole selling a home super fast thing is a little bizarre to me. I get the need to innovate and speed up the process, but homeownership isn’t a decision that should be taken lightly. It makes sense that buying and selling homes should take some time so the parties involved have time to make informed decisions. Hopefully we can find a comfortable medium. Do you sell homes in Arizona? Have a home in Quartzsite, AZ looking to sell.